When a copyright infraction occurs, the content owner is given the Internet Protocol address of the downloader and the associated Internet service provider the violation can be reported to. The ISP then penalizes the user as they see fit. Many call the system the “six strikes” program, referring to the six degrees of increasingly disciplinary alerts sent to users. Although the CCI is meant to “alleviate confusion” of copyright infringement, many crucial details have been left up in the air. Rather than standardize the exact penalties, implementation is left up to the individual ISP. This could encourage providers to compete for customers by using ostensibly permissive copyright infringement policies as a selling point. Proposed penalties include informational videos and mandatory courses analogous to traffic school. Habitual offenders may be subject to slower download speeds or the inability to access certain sites. The Center for Copyright Information is a nonprofit group formed solely to combat online piracy. Its makeup is primarily a collaboration of content creators from the music and film industries and five ISPs: AT&T, Verizon, Cablevision, Comcast, and Time Warner Cable. Each side of the collaboration has something to gain from this initiative and its exclusion from formal government regulation. Courts have repeatedly ruled that an IP address does not adequately prove criminal activity. 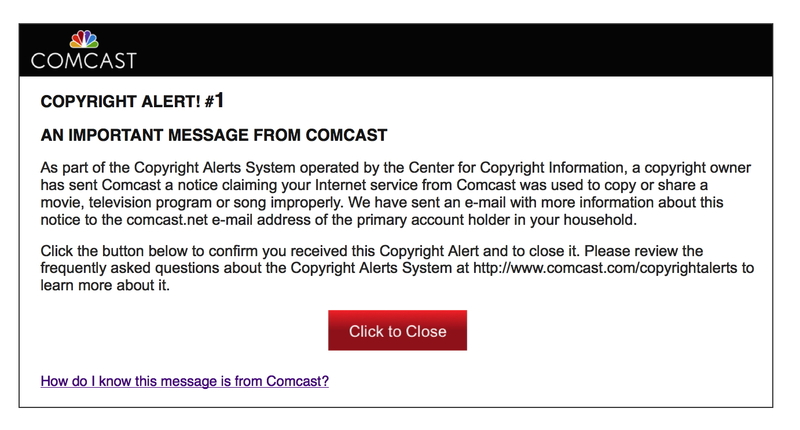 However, the Copyright Alert System can use any arbitrary reasoning it likes because it does not directly charge offenders with breaking the law. Instead of going through the courts or seeking legislative change, content owners like the Recording Industry Association of America (RIAA) and the Motion Picture Association of America (MPAA) have found a way to stop piracy at the source: Internet service providers. Because the CAS inextricably links incriminating activity with the IP address used, the Open Wireless Movement will be discouraged as network providers would be held responsible if illegal activity is detected on that IP address. Public Wi-Fi would be eliminated, forcing most people to pay for their own private Internet connections. This scenario highlights why five major ISPs are members of the Center for Copyright Information and helped draft the CAS. The CCI’s website further reveals that the six strikes’ goal of “consumer education” covers the true interests of content providers. It suggests, as an alternative to unlicensed content, the many digital distributors and on-demand services provided by CCI’s corporate members. Online piracy has been rampant for years, and Congress still does not have a clear understanding of how it works, much less effective ways to counter it. This was evident by SOPA and PIPA, two anti-piracy laws widely considered misguided attacks on free speech. Both were indefinitely postponed last year after strong public opposition. The Center for Copyright Information did not necessarily originate as a business opportunity. It is only natural for industries to seek warranted compensation for their work and protection against theft. However, the CCI’s efforts to create a more lawful customer base are demeaned by the profit-seeking tendency of its sponsors. Xander Pakzad is a social media intern at IVN. He currently attends UC San Diego, double majoring in communication and interdisciplinary computing & the arts.